The sandy spread of Alappuzha beach makes a lovely contrast to the crisscrossing canals and breathtaking backwaters of the region. 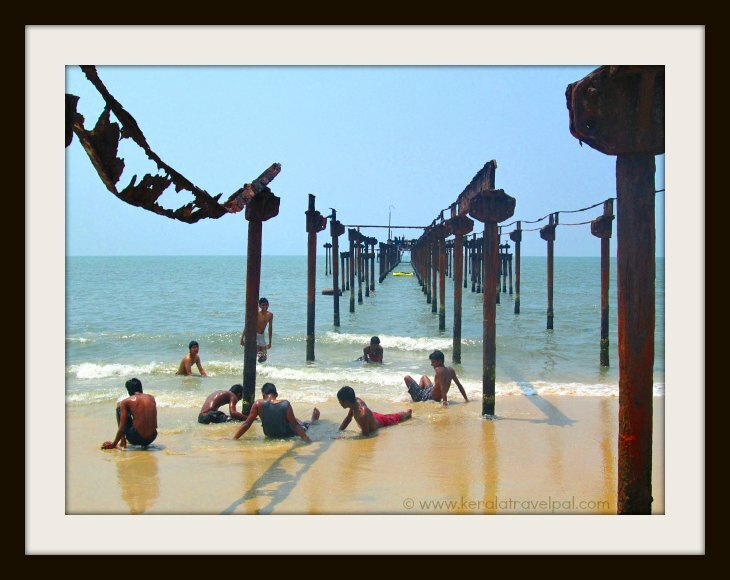 The beach is just 4 Kilometres from Alappuzha (aka Alleppy) town which is the backwater head-quarter of Kerala. 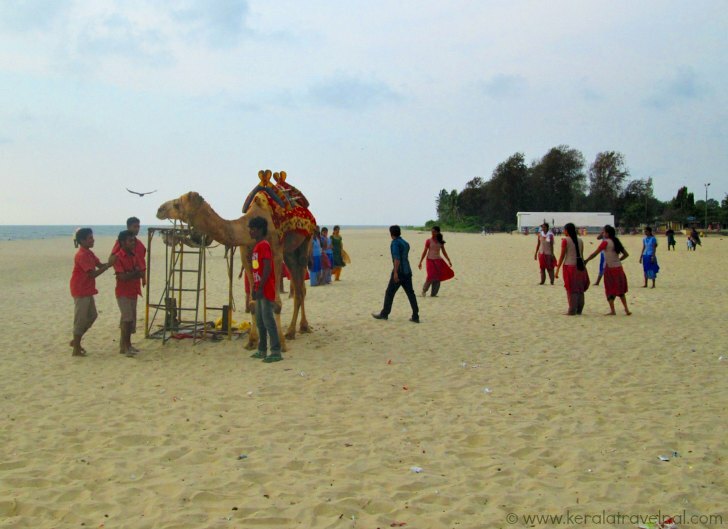 International tourists reach Alappuzha beach mostly to have an addendum to their backwater holidays. After surprisingly new experiences at Kumarakom backwaters and Ayurveda rejuvenation therapy centres many reach here to the lap of the good old beach. How comforting! There is a caveat though. Do not expect to find a secluded beach, especially during peak times. The popular picnic point for locals draws people from the nearby towns and villages of the district. Beach sands surrender to them during evenings and weekends. That should not be a concern of magnitude as the beach lovingly spreads its fine sands far and wide in the feet of extended rows of coconut palms. Enjoy nature as the cool currents of fresh sea breeze mildly touch moist hair and sand covered skin. Celebrate life with a towering sandcastle. Surf and parasail as you please. Find a new meaning to life with water scooters and speed boats. If you are not into such a meaning of pace try peace instead and simply swim in cobalt blue waters. Remember, volley ball is waiting wanting all that your hands can give. Well, if you are still not content, try beach side attractions. The pier, Alappuzha beach light house, Vijay Park and Sea View Park while part of the beach experience, make statements in own ways. An eventual state of disrepair is taking over the oldest pier of Kerala. Unsurprising fate encountered by a heritage structure that resisted the onslaught of sea for 140 years. This pier was once the much needed cargo handling solution for the busy port of Alappuzha. As an efficient means to unload cargo from ships, it served well during the time of Travancore Kings who built it. During peak period, it saw ships in plenty. Those were the golden days of Alappuzha sea trade. As time went by, oblivion took over the port. The aged witness stands 1000 ft into the sea, attesting to the busy days of Aleppy sea trade and its relapse. Vijay Park is amusing, especially for families with children. The child friendly park with its toy train and bicycles puts smiles on youngster’s faces as they enter action zone. Smiles can be contagious since parents enjoy a much deserved air of freedom. This popular local picnic spot is open for visitors from 3:00 PM till 8:00 PM daily. Sea View Park has its focus on water. This neighbour to Vijaya Park provides boating facilities. It also has a swimming pool. Visitors can hire round boats and pedal boats, mostly 2 and 4 seaters. Rent varies according to boat type. The light house although an aged companion to the pier still radiates shine to a range of 25 nautical miles. 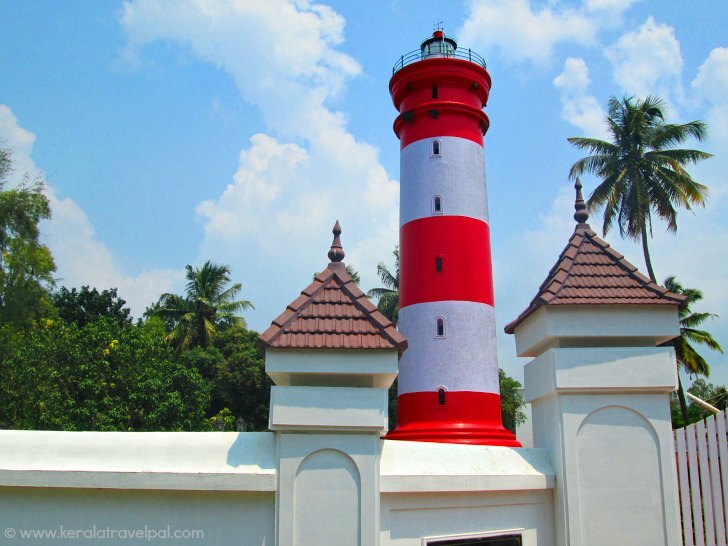 One of the oldest light houses in Kerala stands there 28 meter tall dwarfing surrounding coconut palms. A spiral teak staircase within is the gateway to a bird's eye view. Visitors enjoy views of far and near as a pleasing mix of green, white and blue. Serving sailors and fishermen since 1862, its lamp often changed. Decades came and went between the days of double-wick coconut lamps and the current era of metal halide globes. Lamps may have changed yet the light of guidance remained the same. Supervised by government officials, visitors are permitted during the short period of 3:00 PM till 4:30 PM. Alleppy beach lighthouse can be contacted on +91-477-2253459. The wateresque Alappuzha town, fondly called Venice of the east gets a steady flow of tourists most part of the year. Simple home stays to expensive resorts have come into being to cater varying needs. Many find staying at Alappuzha town not too bad as they combine other activities to their Aleppy beach holidays. For those prefer to spend Alappuzha beach vacation just near the ocean front, there are a few places near the beach as well. Alappuzha is well connected to other Kerala cities by road and rail. Cochin Airport (Nedumbasseri) at 85 Kilometers is the nearest airport. Reaching the beach from Alappuzha town is easy. Private buses and Auto-Rickshaws take you there. Taxis may also be of avail however some of them may be reluctant for such a short trip. To avoid rip offs, check the travel cost before you hire. Air port : Kochi Int’l Airport (COK)at 85 kms and Trivandrum Airport (TRV) at 155 Kms. Best time to visit : October to May. Can be visited anytime during the year if you do not mind wild weather with heavy rains (June-August). Nearby Attractions : Kumarakom, Alappuzha & Kuttanad for backwater rides, Kumarakom bird sanctuary, Aruvikkuzhi waterfall, Alappuzha town (food & shopping), Pathiramanal Island, Krishnapuram Palace, Karumadikkuttan, Arthungal, Chavara Bhavan and Edatuva Church.